A career in therapy can be an incredibly rewarding job for someone who likes to interact with and help people. Time spent helping people to lead more productive, functional and happier lives can be deeply satisfying. Still, many people become therapists without knowing or understanding the true requirements of the profession. Understanding what it’s truly like to be a therapist can help you decide whether this profession is right for you. In the time before you become licensed, you’ll spend a lot of time working with populations outside your focus. These months will teach about the myriad ways that people respond to therapy. Take advantage of this opportunity. Soak up the experience by immersing yourself in study and learning as much as you can about each population. By the time you get your license, you’ll be more comfortable than ever working with complex people and helping them through their issues. Unless you’re doing something ethically wrong, there are no mistakes in therapy. However, you will have growing experiences; many, many growing experiences. Beating yourself up over these experiences can only damage your confidence and make you less sure of your methods. Follow your instincts with each patient. You’ll find that letting the patient lead can help you in times when you’re feeling unsure of your footing or the way to proceed with a patient. Patients who are motivated to be in therapy will guide themselves through much of their own trouble. Think of yourself as a facilitator instead of a leader. Trust is the foundation of a good relationship between a therapist and a patient, but real trust can take months or even years to build. There are many techniques you can use to build trust, and over time you’ll discover the best methods that work for you. Be yourself. If you are honest and genuine with your patients, eventually they will reciprocate. This can help your patients become more receptive, talk more, and have more productive sessions. Take your time. Relationships with patients develop at a similar pace to relationships that you have with friends and loved ones. Allowing patient/therapist relationships to build with time will help ensure that those relationships are healthy and productive. Take continuing education. Continuing your education even after you become licensed will help ensure that you continue to grow in your profession. The more you know, the more you can help your patients. Offer excellent customer service. Good customer service practices reflect well on you as a professional. Call clients back quickly, stay organized and maintain an orderly office. This professionalism can help develop trust with your clients even before they come in for their first session. Therapists in a private practice will take years to develop a strong, steady client base. This can make for some tough years at the beginning. Networking, introducing yourself to others and encouraging referrals can help you build up your client base more quickly. Staying organized, maintaining good business practices and offering excellent customer service can help you get referrals. It also helps to have a specialty, especially if that specialty is a badly needed service in your area. Therapists spend a lot of time telling people to take care of themselves without taking time out to help themselves and to pay attention to their own emotional state. This is important for everybody, not just your clients! You’ll be a better therapist and a better listener if you help yourself and tend to your own emotional needs. 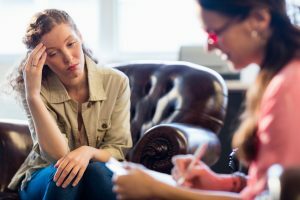 You may find yourself working too hard in your first years as a therapist, and some of the troubles that your patients experience may start to wear you down. It’s important to take a day off from time to time. Spend quiet time reflecting on your life, your priorities and your goals for yourself. This will help you have a satisfying life and a more successful practice. On television, therapy is glamorized and idealized. Patients lay on large leather couches in an academic-looking office, stare at the ceiling and discuss details of their childhood with an aloof looking healthcare professional. In real life, therapy happens in a variety of different settings, sometimes with a couch sometimes not. In fact, you'll need to tailor your office to the type of patients that you’ll be treating. If most of the patients you see are children, for example, it’s a good idea to have an office with toys, colorful furniture and small chairs for kids who are still growing. You'll spend more time playing than sitting, as will your patients. Some patients will seem as if they aren’t making progress. When you encounter a patient like this, the best thing you can do is to reassure him or her that you’re committed to your patient's success and that you’re here for him or her. However, it’s also important to understand that you won’t be the right therapist for everyone. If your patient fails to grow during therapy sessions, this could be because of a failed connection between you and your patient. In cases like this, sometimes referring the patient to someone else can be more helpful. Body language plays a huge rule in the communication between you and your patients. You’ll start to notice body language in patients over time. Some patients will make eye contact, others will stare off into the distance. Some will fidget, others will sit calmly. You’ll get very good at reading this body language as you gain experience. However, it’s important to understand that your body language sends as many signals to your patients as their body language sends to you. You can exude confidence, friendliness and kindness by sitting calmly, smiling and avoiding fidgeting. This will help you gain the trust of your clients during sessions. Practice this type of body language when not in sessions to ensure that your body language seems natural. Going to therapy isn’t enough by itself; your patient needs to want the situation to improve. The personal motivation it takes to work on problems and to improve a personally difficult situation is not something the therapist can plant in a patient. This motivation must be internally driven. If you encounter a patient who is disinterested or unmotivated to meet the goals set in therapy, this is a sign that your patient isn’t ready for therapy. In a case such as this, you and your patient may need to take a step back and evaluate the situation before moving forward. Continuing on the same path may not be helpful to either one of you without making a significant change. Being a therapist can be depressing, for a variety of reasons. The constant struggle to develop trust, cultivate a relationship and set goals for your patients only to watch them struggle, even after months or years of therapy, can cause you to feel a little pessimistic after time. Therapists must develop a thick skin and a sense of confidence to help them continue to enjoy the profession. The people who seek therapy are all unique. Each person will manage his or her problems in their own time and in their own way. Sometimes progress seems to happen quickly, but often this progress will be slow, meandering and difficult to gauge. As a therapist, you may wish to see some of your patients progress more quickly, but this is not how therapy works. Pushing your patients harder can hurt your trust, damage your relationship and negatively impact the progress you manage to make. Taking things at the pace set by your patients will be beneficial to you both. Viewing your patients as broken people who must be fixed can negatively affect your interactions with your patients. Your patients may sense, and resent, these feelings. True, your patients do need help and are asking for help from you. Your job as facilitator is one of helping the patients on a good path. What your patients need, more than anything else, is to take productive action to put their lives on the right track. Keep this in mind at all times while you work with patients. Learn more about the various careers in therapy and online MFT degrees. Many of these things will be learned after you become a therapist, but it's good to know these details when going into the profession. For more information, try interviewing therapists in your community. Talking to working therapists about the realities of the job can help you decide for sure if this is the right profession for you.